Outside View of Completed Installation. 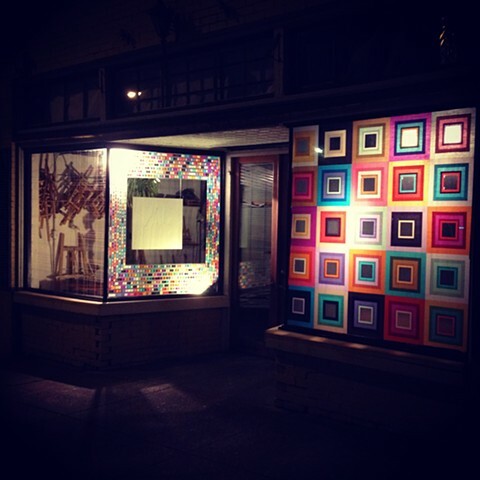 This installation was produced in collaboration with artist Abby Sherrill at Raza Cosmica, an Oil and Cotton window gallery, in Dallas, Texas. "Jon Vogt and Abby Sherrill collaborated to produce color play. Their window installation explores the interplay of color relationships through formal abstraction and pattern. The relatable materials of tissue paper and string are used in consideration of the active learning community of artists young and old who participate at Oil and Cotton. Viewers are invited to contemplate and interact with the piece from both outside and inside the space. Light is an important part of the installation, as the visual interaction created by layers of colored tissue paper is transformed according to the position of the viewer and the time of day. A grid pattern is applied and translated between each window display through use of materials to create organizational clarity and movement. In contrast to the playful color of color play, negative space and absent color reflects and celebrates the creative potential of each viewer."